The mighty Chinese buyers can be both a bane and boon to designers who want their business but may baulk at their less-than-subtle tastes. 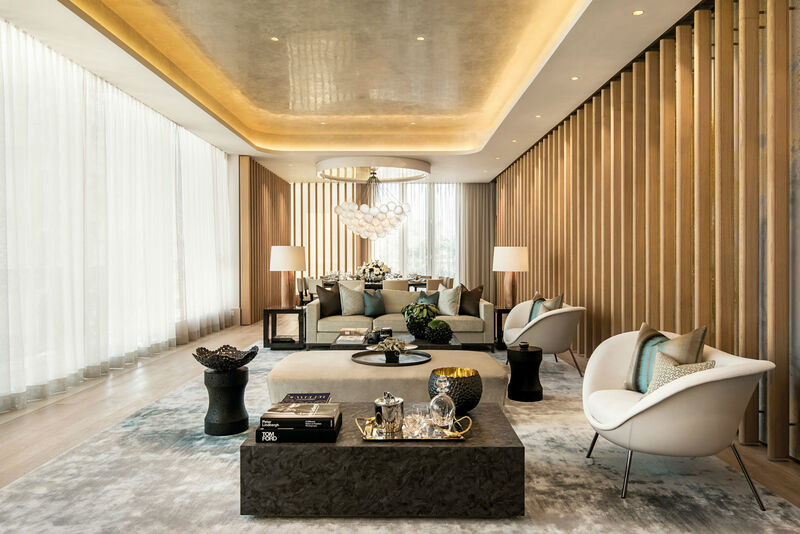 Singapore designer Robert Cheng however, saw it as neither when Phoenix Property Investors commissioned his firm to depict the interior of The Morgan penthouse. His Brewin Design Office did as they’d always done: Go slow and create a calming space full of curated pieces for a unique space. The penthouse sits atop The Morgan, a luxury residential tower designed by New York-based Robert AM Stern Architects on Conduit Road. Occupying the entire 30th floor of the building, it spans 3,962 sq ft, which includes five bedrooms (one of which has been turned into a study) and a 1,461-sq-ft private outdoor area from which to take in breathtaking views of Victoria Peak. The view from the living room, however, was less than ideal. “The first thing we were asked to do was find a way to block the views of the surrounding buildings since the window facade faces north into the crowded city,” he says. After testing numerous variations, he achieved this with remote-controlled vertical fins made of white oak. To further draw attention away from the concrete jungle, the other side of the room features 30m-long wallpaper by Brooklyn-based company Calico behind the fins. The abstract expressionist design, with its splashes of gold, silver and pastel colours, was customised by Cheng and his team. “We treated the whole thing like an installation. The fins envelop the living room like a skin so you don’t feel the wall anymore,” he explains. In the same area you’ll find the dining room, where a 73-piece blown glass chandelier by Apparatus hangs over a 12-seat dining table like an inverted bunch of balloons. No pillars or walls divide the space, and a palette of cream, pale blues and greens — inspired, he says, by the mountain and the tinted windows of the neighbourhood’s 1980s-style buildings — unifies the overall aesthetic. The airy calm is punctuated by a accessories in dark lacquer as an ode to Chinese art deco. While the penthouse enjoys high ceilings, Cheng had a different idea for the master bedroom. “High ceilings feel luxurious but I felt it took away the intimacy you need in a master bedroom, so I lowered the ceiling by building a timber cube in the rectangular space; think of it as a room within a room,” he shares. The Tatami Room best exemplifies his desire for zero ostentation. The floor was raised to give the illusion of floor-to-ceiling windows, and earthy hues and a specially designed tatami-like fabric flooring set the stage for the unimpeded view of the greenery outside. The building’s architecture was another source of inspiration for Cheng, particularly for the outdoor space. Featuring its own living and dining area, the terrace houses a vertical garden that echoes the massive 12m-tall one found on the facade of the building.